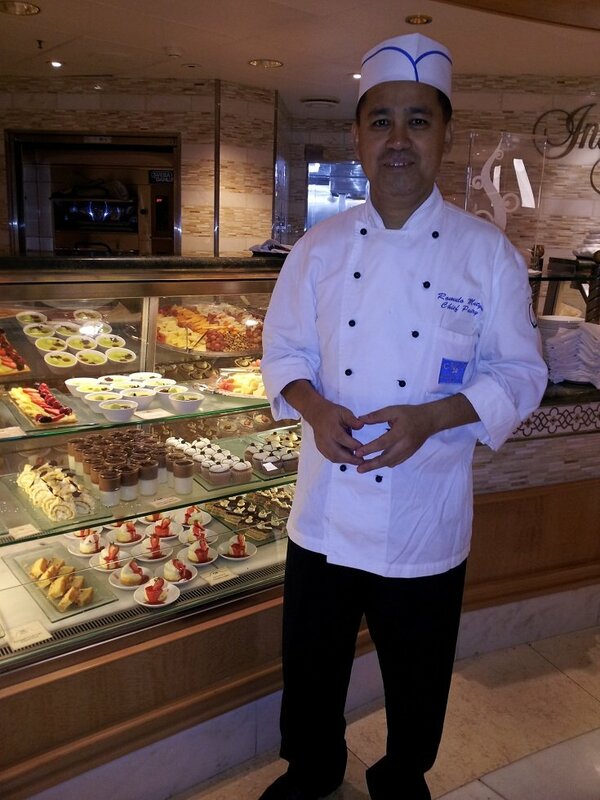 Talk about a hard-to-reach person, Executive Pastry Chef Ramulo Mutya has his job cut out for him on the Grand Princess ship. Day after day went by, and although I had planned to meet with him, it was not working out. The first two days of the cruise we had 32 foot waves hitting the ship, so basically we were rocking back and forth. A lot. Dramamine was flowing freely for those of us (me) who cannot handle the movement. I had the wedding to attend, and of course, several shore excursions. Finally, Thursday, December 8, I was able to spend 10 minutes with Ramulo. He met me in the ship's main lobby by the International Pastry Bar (where else???). I found out that he has been a pastry chef on cruises for 25 years, 18 of them having been spent on this particular ship. He is from the Philippines, having spent 3 years in culinary school in Manilla. He chose the baking field because he enjoys creating pastries over regular food. Why does he bake on a big boat? Easy--the pay is good. Back home in the Philippines he would never be able to support his wife and children on a regular baker's salary. Instead, he spends most of the year on the ship, with a small indoor cabin located on deck 4, which is only barely above sea level. He takes only a short time off to spend with his family back home. Seven out of twelve months Ramulo is at sea. Although his wife and children miss him, he says his family is much better off with him working 7 months of the year than staying in the Philippines and working full time...and if we average out the time he spends on the boat, it might be equivalent to a person working full-time in a "regular" type of job. It's not a job cut out for everyone, that's for sure. I had to commend Ramulo on one particular chocolate dessert that I loved. Of all the desserts I tried, my favorite one was, hands-down, the flourless chocolate cake. I thought for sure it would be his favorite item to make since it was so incredibly good (see future post on that review), but oddly, he loves making souffles, and trust me when I say his souffles are marvelous. Ramulo knows, however, because he has to taste everything he makes to ensure quality. How does he watch his weight? All ship employees are free to go to the employee gym to work out when not on duty. He swears he runs at the gym but that his "great metabolism" is what helps keep the weight from piling on. Since this interview took place on a very busy formal night onboard, I did not want to take up too much of his time. I asked him what pastries he recommends, and with a laugh, he said, "All of them." I had to smile, too, because by that point in time I had pretty much sampled all of them.